Chris Hadfield pictured at Shannon Airport this week. The world’s most famous modern day astronaut Chris Hadfield jetted into Shannon Airport last week and stated it was good to be back on Ireland’s west coast. 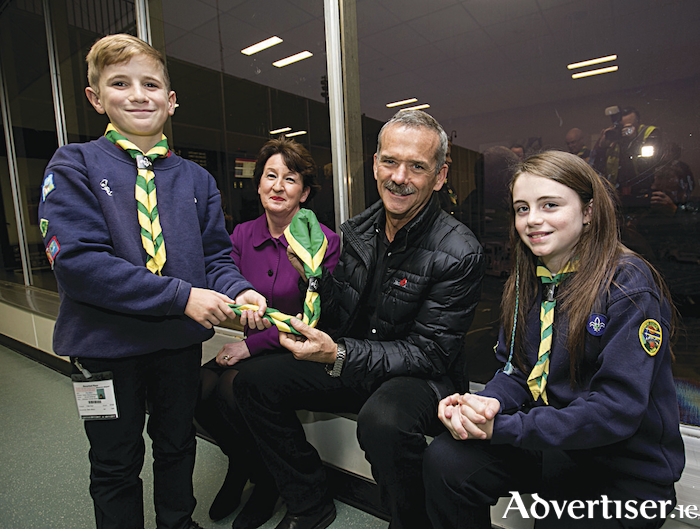 Hadfield – a cub scout from his childhood days - was given a warm Shannon welcome on arrival as he was greeted by scouts from the 1st Clare Shannon Scouts and by Rose Hynes, Chairman of Shannon Group – Shannon Airport’s parent company – and Shannon Airport Managing Director Andrew Murphy. Said Mr Hadfield: “I’ve always had an interest in Ireland and Irish culture; hence my tweet As Gaeilge from space. Shannon Airport MD Andrew Murphy said it was a great privilege to meet Chris. “It’s not every day you get to meet a man who has circumnavigated the globe 2,650 times. He’s a space star for sure but the great thing is his feet are firmly on the ground and that’s evident the moment you meet him. “He’s a great supporter of Ireland and the west coast and we made it clear to him that we’d have him back anytime,” he said.